The Quality Milk Production Services Program (QMPS) promotes the quality of milk by reducing mastitis levels in dairy herds. QMPS offers a variety of services, notably on-farm evaluations of management and equipment and whole herd milk cultures. Based on the findings, the program's extension veterinarians advise producers, veterinarians and milk inspectors regarding optimal practices for improving herd health and farm management. Quality Milk Production Services is making major contributions in the diagnosis, control and treatment of several causes of mastitis, including agents such as Streptococcus agalactiae, Staphylococcus aureus, Mycoplasma, Streptococcus spp., Staphylococcus spp. and coliform bacteria. Research continues on new methods of mastitis diagnosis, epidemiology, financial effects, nonantibiotic therapy, bacterins and association with stray voltage. QMPS is a program of the Animal Health Diagnostic Center in the Department of Population Medicine and Diagnostic Sciences within the College of Veterinary Medicine at Cornell University, and is supported by the Department of Agriculture and Markets of New York State. As the largest organized program of its type in the world, QMPS extends an array of services to clients within New York State as well as to other states and other countries worldwide. QMPS exists to meet the needs of producers, veterinarians and the dairy industry through on-farm service, diagnostics, education and research. We are a science-based organization utilizing the most effective methods and technology to help producers improve dairy product quality and safety. Our work contributes to consumer confidence in the dairy industry. We accomplish our goals through an environment that encourages teamwork and continuing education. We aim to be recognized as a definitive source of information on milk quality and food safety. We want to assist the dairy producer in achieving greater profitability through higher milk quality and improved herd health. We continue to improve team building and standards of excellence through improvement of communication and encouragement of personal growth. 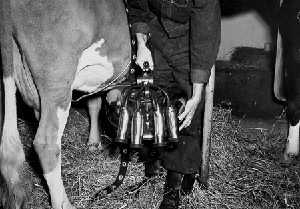 The Quality Milk Production Services, formerly known as the New York State Mastitis Control Program, was begun in 1946 by then Governor Thomas Dewey. 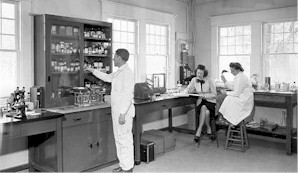 Over the next 30 years it was operated out of the Veterinary College at Cornell. In 1975, it became a program of the Department of Agriculture and Markets. 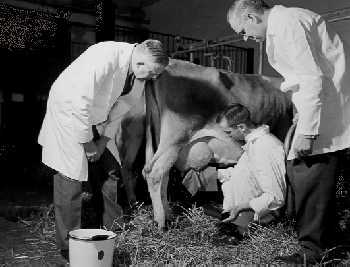 Until 1986, the Quality Milk Program was a part of the Department of Clinical Sciences in the Veterinary College. 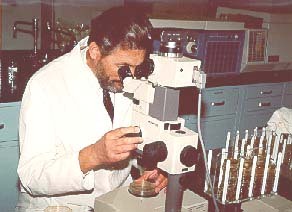 In 1986, Quality Milk came under the administrative umbrella of the Diagnostic Laboratory where it resides today. The Quality Milk Program has developed over the years from being mainly a diagnostic program to one with a comprehensive extension education focus designed to offer assistance to all dairies in the state in a preventive program. The Program has become known throughout the world for its unique services. The Program has worked closely with colleagues in the Colleges of Veterinary Medicine and Agriculture and Life Sciences in developing specific programs aimed at mastitis prevention, prevention of other diseases, and quality milk production.